Be the first to share your favorite memory, photo or story of Nola. This memorial page is dedicated for family, friends and future generations to celebrate the life of their loved one. 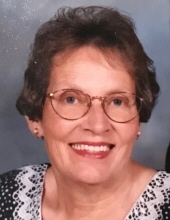 Nola “Rosalie” (Chesnut) Watkins of Newton, Illinois, born October 14, 1932 went home to be with her Lord and Savior on March 2, 2019 at Lewis Memorial Christian Village, Springfield, IL. Rosalie was the only child of Cecil and Mary (Brown) Chesnut. She married Ray “Rex” Watkins, Sr. on October 30, 1949. Rosalie was preceded in death by her parents, her husband of 60 years, two great-granddaughters, one great-grandson, and one son-in-law. Surviving are her son, Ray (Donna) Watkins, Jr, daughters, Lynn (Robert) Albright, Susan (Raymond) Tolley, Jo (Condie) Holt. Rosalie is also survived by 11 grandchildren, and 29 great-grandchildren. A graveside service was held on March 5, 2019 at 11:00am in the Honey Cemetery, Bogota, IL. Memorials may be made to the First Baptist Church, 400 W Washington St, Newton, IL 62448, or Safe Haven Hospice, Springfield, IL. To plant a tree in memory of Nola Rosalie Watkins, please visit our Tribute Store. "Email Address" would like to share the life celebration of Nola Rosalie Watkins. Click on the "link" to go to share a favorite memory or leave a condolence message for the family.